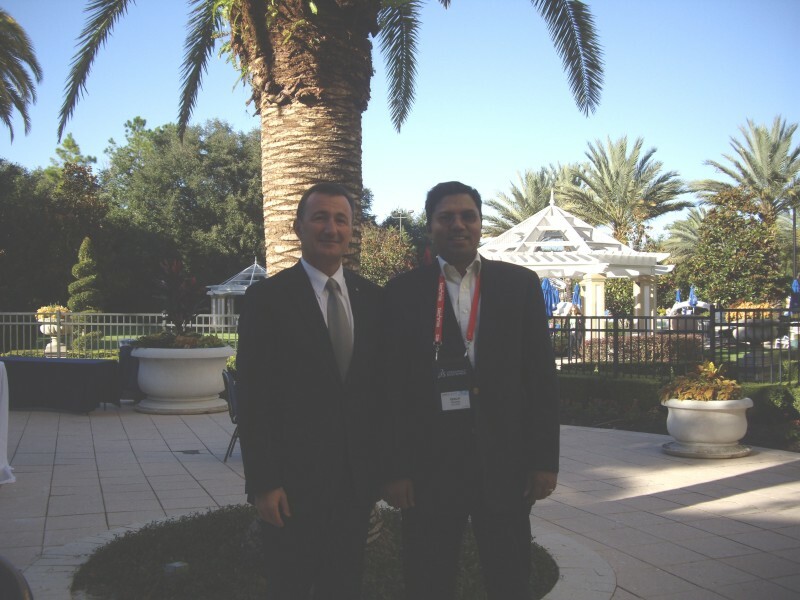 On the first day of DSCC 2010 I had the opportunity to interview Dassault Systemes President and CEO Bernard Charles. I had never met the man or corresponded with him before. This was kind of odd for me because whenever I have interviewed someone I have always known the person for quite some time before. So I really didn’t know what to expect, especially from someone with that kind of a title. Truth be told, I had asked around hoping to get a sense of Bernard from people who had previously interviewed him. In hindsight, I shouldn’t have done that because I went into the meeting with preconceived notions about him and they turned out to be completely false. We spoke about his early years at Dassault Systems, important milestones along the way including mammoth deals with IBM, Boeing and auto manufacturers. He also disclosed how the deal with SolidWorks went down and I managed to squeeze out some information about his plans regarding getting into the AEC market. Unfortunately we ran out of time. He invited me to the India PLM Summit next week in Mumbai which he will be attending as well. Hopefully I will get a chance to take our conversation further there. Deelip: I’d like to know more about your journey at Dassault Systemes. Bernard: I joined Dassault Systemes in 1983. The company was 18 months old at that time. Actually I was asked by the French government to do my military service in a start up company called Dassault Systemes. At that time military service was mandatory. I was a scientist and they thought I would be of good use to start a company. I said, “Yes sir“. I was supposed to do this for one year and then create my own company. But the share holders convinced me to stay one more year. And it seems like I am still in my second year. So as you can imagine, in some ways I am a very frustrated person because I was supposed to create my own company and now time is flying and I need to solve that problem (laughs). Deelip: So what exactly were you in charge of at Dassault Systemes? Bernard: You see, in a startup company, you don’t have many people and one person can have many roles. I formulated the company’s strategy. I created the R&D department, human resource department, planning, all the cooperation with IBM and a lot of other stuff. Then year after year, I assumed different positions in the company and ultimately in 1988 I was asked to handle everything in the company other than sales because IBM was handling that. Deelip: So basically you became the Chief Operating Officer. Bernard: Yes, you can say that. The founder of the company was a financial person who acted more like a VC. Then for reasons that are related only to the fiscal aspect of French taxation, I officially took the job of the CEO in 95. Deelip: So essentially you have been running this joint since 1988? That’s 22 years. Bernard: (laughs) Yes. Quite a journey. Deelip: Indeed. Wait a minute. So you already have your company. Bernard: (laughs) Yes, but this is not my baby. I was not the one who created it. Deelip: Fair enough. Would you like to mention a few milestones for you or the company? Bernard: 1988 was the year when we signed a very big contract with IBM, not only to sell our products, but also to use them internally. So IBM became our customer and I negotiated that contract. Another mile stone would be 1991 or 1992 when we bought CADAM, which at that time was a world leader in electronic drawing. We bought CADAM from IBM, who in turn had bought it from Lockheed Martin. Around 94 or 95 I negotiated an exclusivity agreement with IBM where they would sell our CAD products and no one else’s. Another mile stone was when the Boeing CEO, the IBM CEO and myself signed a 10 line hand written paper, which you can find at the Boeing Seattle Museum, which was about committing ourselves to making the Boeing 777 the first airplane on the planet to be designed 100% digitally using CATIA. No physical prototypes would be made and the first prototype would be the real plane which would fly and be delivered to a customer. This was a 10 billion dollar program. Deelip: You signed a commitment to 10 billion dollar project on a 10 line handwritten piece of paper? Bernard: Yes, that is why that piece of paper is kept in a museum today (laughs). There is also a picture next to that piece of paper there that has the prestigious CEO’s of Boeing and IBM along with a kid called Bernard Charles. This involved 6,000 engineers for 5 years on a global level. After we signed that piece of paper, those two CEO’s asked me, “Bernard, do you think it’s going to work?” And I replied, “I wish I knew“. (laughs) But seriously, just think about it. This was the first ever attempt to design an entire airplane completely digitally. I am talking about 3 million parts. It’s just a mind boggling scale. And by the way, IBM were so happy because they delivering trucks of mass memory and mainframe computers to Boeing every day to support those engineers. Deelip: And I assume the first plane flew. Bernard: Actually there are books written about this. When the first airplane was assembled, there was less default in airplane number 1 than after twenty years of assembling a 747. Bernard: So at that time we knew that the world would go towards digital mockup. I remember the first demo we did to Boeing. The purpose of the demo was to show that we could to the digital modification of a 747/400 perfectly right. I did the demo myself. And you know what happened? When they started to assembly the modification to the 747/400 the hydraulic assembly would not fit. So we got scared and thought, “My God! We have made a mistake“. Maybe there was some error in geometry. But as it turns out our geometry was perfect. The airplane had some defaults and the new hydraulic assembly did not fit with the old parts. That’s how Boeing discovered that in the future planes will be designed digitally. And that’s how the decision was made to go ahead with the 777. Anyways, then the automobile industry started wondering why it was possible to design an airplane digitally and not cars. Deelip: I always thought that it was the automobile industry that embraced 100% digital design first. Bernard: No. And you know what? Sometimes it was difficult for me to convince the auto people because their engineers told me that the car was more complex. Deelip: You mean a car was more complex than an airplane? Deelip: And what did you say? Bernard: I called the CEO and asked him if he wanted to see how our Falcon jet at Dassault Aviation was designed. So he took his Falcon jet and flew to Paris. I picked him up from the airport and took him to Dassault Aviation and showed him how we designed airplanes. He flew back and told his engineers, “We are going to design cars digitally“. Deelip: So previous to this how did they design cars? Was it 2D drawings and hand made mockups? Bernard: Yes, it was all 2D drawings and for the body they made physical models and prototypes. So that’s how the automobile industry adopted our solution and then we went to ship building. Deelip: I thought the main player in the ship building industry was Tribon. Bernard: At that time there was Computervision, Intergraph and many others. Now we have Tribon. You call it standard. But I will call it legacy (laughs). But seriously, all the military ships in America, submarines, huge aircraft carriers like the USS Enterprise are all designed with our software. All the Pentagon equipment that is above water or under water is designed with our software. We have a hugely involved in military ships which are way more complex than vessels like tankers. I think that with this we can go ahead and win the ship building industry step by step. We already have some huge customers in India like L&T. Deelip: I have noticed one thing about Dassault Systemes. You don’t advertise. Your external facing branding activities are not very noticeable. Is that intentional? Bernard: (Laughs) My dream is that someone one day will write a book which says, “Here is the biggest secret. A company that is not known and their products are used everywhere“. Deelip: So do you intend to keep it that way? Bernard: Well, I don’t know if I will keep it that way because now I sense a greater push from customers and partners to make Dassault Systemes more visible. But clearly CATIA is known worldwide. It’s the number one brand. SolidWorks is also known worldwide and it the number one brand in its category. Deelip: Yes, but SolidWorks does advertise and it has become a household name in the engineering space. Bernard: Yes, but do you know Louis Vitton and Christian Dior? Sure. But do you know who owns those brands? Probably not. So maybe people don’t know Dassault Systemes a lot but we have SolidWorks that has 52% of the market share in its category. Deelip: Speaking of SolidWorks, tell me more about that deal. Bernard: I bought SolidWorks in 97 when it was a startup. I spent a year negotiating with Jon Hirschtick. I used to take a plane from Paris to Boston every month, have salmon and bagles for breakfast, have a discussion with him and then fly back. And then after a year I said, “Look Jon. You have a company of 60 people. You are doing 9 million revenue. You are losing money. but I love what you do“. And I put 320 million dollars on the table and I said do you accept that check. That’s 320 million dollars for a 9 million dollar company losing money. And Jon replied, “I cannot refuse“. So then I went back to my board and the family and said, “I got an idea. I want to buy a company for 320 million dollars“. They said, “Well, its a lot of money. How much revenue do they make?” I replied, “9 million“. They said, “Bernard, maybe you have traveled too much. You might want to go back home and take some rest“. So next day I called them and asked, “Do you agree?” And they replied, “If you think that’s the right thing to do, go and do it.” And so we did it. Deelip: And look where SolidWorks is today? Bernard: Yes, 52% market share is no joke. Deelip: Till recently SolidWorks was allowed to do its own thing. But now it appears that Dassault Systemes is exerting greater influence on it. Is that so? Bernard: No. That’s what you think. I have been the Chairman of the company since July 97, the day I bought it. Since then, every six weeks, we have been having very precise meetings about hiring, development plans and other stuff. But why should I have presented myself in a role outside when the team was doing a good job? The reason why it is becoming more visible now is because we have reached a level of size with SolidWorks which amounts to 20% of the total revenue of Dassault Systemes. And some of the customers are saying that they want to expand the role of SolidWorks to PLM. So now they need to know more about Dassault Systemes and what we can provide to them. SolidWorks customers can now continue to grow with us. Deelip: And I guess the same thing is happening with Spatial as well. Bernard: Spatial is in the component market and we have reached a point where we want to expand the portfolio of components to include V6 components. So we can now deliver more to Spatial customers as well. When you look at our six brands four of them are number one in the world. SolidWorks and CATIA are number one. ENOVIA in revenue is number one. SIMULIA is number two. But then it was number three two years ago. 3DVIA is the new baby. Deelip: This is my first DSCC event and from what I have seen and heard at the general session today, you might as well could have called it an ENOVIA event. Because all that I have seen is ENOVIA and PLM. The DS executives who spoke and the customers who presented were all talking about ENOVIA and nothing else. There was no mention of CATIA, SIMULIA, DELMIA. SolidWorks was mentioned once. There has been some talk about DraftSight. But almost everything has been about ENOVIA. Is it always this way? Bernard: I think this is a very good point. But what PLM is for you is not PLM for me. The PLM that you are referring to is the old definition of PLM which is more like a PDM plus. That’s not my view of PLM. The old PLM was simply the management of the data related to a product. For me the future of PLM is about creating the product, the simulation model, the way you produce the product, the lifecycle of the way you are going to maintain the product and putting all that in a collaborative environment which is extremely efficient. So its everything. It goes with the authoring tools – SolidWorks or CATIA, simulation by SIMULIA, manufacturing by DELMIA and ENOVIA is the collaborative platform. PLM is everything for us. Today when P&G was talking about PLM they were talking about design, simulation, manufacturing, materials, compliance and a whole lot more. They were not talking just about ENOVIA. Deelip: I am almost convinced that you want to get into AEC. Bernard: Yes, you are right. But do you know that we are already doing stuff with companies like Gehry. Deelip: Yes, but that is not what I am talking about. You are talking about the specialized AEC consisting of high end solutions. I am more interested to know whether you want to stick to this specialized AEC or get into AEC in general? Deelip: I don’t believe you chose the name DraftSight by chance. I believe that the D and S in DraftSight were chosen for a reason. I believe you are looking at making “DS” a house hold name in the AEC market. Bernard: We have announced that we are doing LiveBuildings online. We have also announced that we will be doing building engineering. So it seems that you have a good vision. Deelip: Thanks. But are you going to answer my question or not? Bernard: (Laughs) We will go there. We will go there progressively.